The use of many varieties of seaweed is becoming increasingly popular, and many people are becoming curious about seaweed nori nutrition. Sea vegetables, often referred to as seaweeds, grow in salt water and some freshwater lakes. They are usually found growing on coral reefs and around rocky areas. Seaweeds are categorized into three main groups. These include red, green, and brown seaweeds. 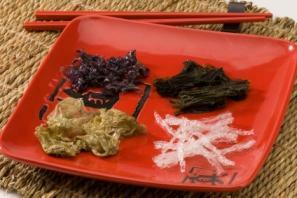 The term "nori" is Japanese and is a generic word used to refer to all of the edible varieties of red seaweed. You may have heard of nori that look similar to dark sheets of paper. These are often used for rolling sushi. The nutritional profile of all of the edible seaweeds is fantastic. Seaweed grows in the ocean, which is full of minerals. As a result, seaweeds contain all of the minerals found in the ocean, which happens to be very similar to the mineral content of the human body. Not only does seaweed offer a high nutrient content, according to the Institute for Traditional Medicine, it also offers medicinal value as well. Seaweeds are perhaps most well known for having high iodine content. Iodine is a mineral essential for the thyroid gland to function properly. The thyroid gland helps to regulate many bodily processes and a deficiency in iodine can lead to a disease called goiter. A goiter is an underactive thyroid gland that has become swollen. A person suffering from goiter will appear to have a large, thick neck. Children with goiter are likely to experience stunted growth and mental retardation. The majority of the earth's iodine supply is in the ocean. This means that sea vegetables are an excellent source of iodine. The iodine content varies by the variety of seaweed. However, for many of the edible seaweeds, just one tablespoon offers over 100% of the recommended daily amount for iodine. Most of Americans think of dairy products when they think of calcium. However, there are many other calcium-rich food options for individuals looking to avoid dairy. Most seaweeds provide an excellent source of calcium, with kelp being one of the most calcium-rich seaweeds available on the market. In fact, kelp actually contains more calcium than cheddar cheese! Iron is another mineral that many vegetarians and vegans worry they may not consume enough of. This is because meat from animals is the most well-known source of iron. However, many plant foods including seaweed contain iron. You can meet about 1/5 of your daily iron needs by consuming 1/3 cup of most seaweeds. Sea vegetables are highly nutritious foods. They are also very low in calories. One 1/3 cup serving of seaweed has around just 20 calories. Seaweeds really are one of the world's great nutrition powerhouses. So, when you are looking for a salty and nutritious treat, don't forget to consider the amazing properties of seaweed nori nutrition!